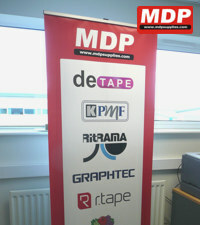 New for 2019, a new 420gsm roll up PET banner with a crisp matt white finish and a grey back designed for roll up banner cassettes. Suitable for solvent / eco-solvent, UV and latex printers. Sold by the full 30 metre roll. 914mm wide x 30 metres. Price for 1 - 4 £54.95 ea. Price for 5 - 9 £52.95 ea. Price for 10+ £50.95 ea.